Chronic gastro-oesophageal reflux disease and excessive body fat are considered principal causes of Barrett's oesophagus (a metaplastic change in the cells lining the oesophagus) and its neoplastic progression, oesophageal adenocarcinoma. Metabolic disturbances including altered levels of obesity-related cytokines, chronic inflammation and insulin resistance have also been associated with oesophageal cancer development, especially in males. Physical activity may have the potential to abrogate metabolic disturbances in males with Barrett's oesophagus and elicit beneficial reductions in body fat and gastro-oesophageal reflux symptoms. Thus, exercise may be an effective intervention in reducing oesophageal adenocarcinoma risk. However, to date this hypothesis remains untested. The 'Exercise and the Prevention of Oesophageal Cancer Study' will determine whether 24 weeks of exercise training will lead to alterations in risk factors or biomarkers for oesophageal adenocarcinoma in males with Barrett's oesophagus. Our primary outcomes are serum concentrations of leptin, adiponectin, tumour necrosis factor-alpha, C-reactive protein and interleukin-6 as well as insulin resistance. Body composition, gastro-oesophageal reflux disease symptoms, cardiovascular fitness and muscular strength will also be assessed as secondary outcomes. A randomized controlled trial of 80 overweight or obese, inactive males with Barrett's oesophagus will be conducted in Brisbane, Australia. Participants will be randomized to an intervention arm (60 minutes of moderate-intensity aerobic and resistance training, five days per week) or a control arm (45 minutes of stretching, five days per week) for 24 weeks. Primary and secondary endpoints will be measured at baseline (week 0), midpoint (week 12) and at the end of the intervention (week 24). Due to the increasing incidence and very high mortality associated with oesophageal adenocarcinoma, interventions effective in preventing the progression of Barrett's oesophagus are urgently needed. We propose that exercise may be successful in reducing oesophageal adenocarcinoma risk. This primary prevention trial will also provide information on whether the protective association between physical activity and cancer is causal. During the past three decades, the incidence of oesophageal adenocarcinoma (AC) has risen by more than 300% in females and 500% in males; faster than any other cancer in Western Europe, America and Australia [1–5]. Moreover, the incidence of Barrett's oesophagus, the metaplastic precursor to oesophageal AC (Figure 1), is also rising . The prognosis for patients with AC is poor with a 5 year survival rate of 10-15% [7, 8]. Chronic reflux of gastric contents into the lower oesophagus is widely accepted as the primary cause of Barrett's oesophagus and oesophageal AC . Recent research has demonstrated that excessive body fat is also a cause of oesophageal AC and is likely to act through promoting neoplastic progression from Barrett's oesophagus . Obesity [body mass index (BMI) > 30 kg/m2] is a determinant of acid reflux , and has been associated with a two-fold increase in the risk of Barrett's oesophagus  and up to a three-fold increase in oesophageal AC risk [13, 14]. Interestingly, the co-occurrence of obesity and frequent reflux symptoms increases a person's risk of Barrett's oesophagus by over 30-fold . Body fat distribution also influences Barrett's oesophagus risk. Central obesity indicated by a waist circumference of > 80 cm has been shown to increase the risk of Barrett's oesophagus by over two-fold, independent of BMI and gastro-oesophageal reflux [15, 16]. Adipose tissue is a dynamic endocrine organ. Adipocytes secrete numerous hormones or 'adipokines' that exhibit mitogenic activity such as leptin, adiponectin, interleukin-6 (IL-6) and tumour necrosis factor-alpha (TNF-α). It has been postulated that these hormones may mediate the progression of Barrett's oesophagus to cancer (Table 1). Biomarkers associated with the progression of Barrett's oesophagus to oesophageal adenocarcinoma. The adipokine leptin is secreted by adipocytes and gastric chief cells and is positively associated with insulin levels, inflammation and body fat. In vitro, leptin has been shown to elicit mitogenic [17–19], angiogenic [17, 18, 20] and anti-apoptotic [18, 19] effects when administered to oesophageal AC cell lines, enhancing cellular proliferation. Leptin receptors are also present on oesophageal epithelial cells providing a pathway for signalling . A recent epidemiological study reported that male patients with Barrett's oesophagus had significantly higher leptin levels than BMI-matched controls, but no such association was seen for women . These findings implicate leptin as a likely candidate mediator driving the progression from Barrett's oesophagus to oesophageal AC. Adiponectin is another adipokine implicated in the biochemical pathways to oesophageal AC development. Unlike leptin, adiponectin is inversely related to obesity and has anti-inflammatory and insulin sensitising properties. Adiponectin circulates as three oligomeric isoforms: high molecular weight (HMW), medium molecular weight (MMW) and low molecular weight (LMW) adiponectin. HMW adiponectin may be the major bioactive form as decreased levels are more closely correlated with insulin resistance and metabolic dysfunction than total adiponectin . In vitro, total adiponectin has been shown to act on specific receptors to increase apoptosis  and inhibit leptin-induced proliferation in oesophageal AC cell lines . The expression of adiponectin receptors have also been shown to be reduced in Barrett's oesophagus epithelium at the mRNA level . Low levels of total adiponectin have been associated with Barrett's oesophagus , oesophageal AC , and a range of other obesity-related cancers . Individuals with Barrett's oesophagus also exhibit signs of chronic inflammation indicated by higher circulating levels of inflammatory mediators such as IL-6 [28, 29] and TNF-α . The protein expression of TNF-α is also notably elevated in Barrett's oesophagus tissue samples and even more so in AC tissue . Additionally, TNF-α has been shown to stimulate the proliferation of oesophageal AC cell lines in vitro . Further evidence of a link between inflammation and oesophageal AC comes from findings that weekly users of aspirin had a 50% reduction in oesophageal AC risk [32–34]. Because insulin has a range of actions (mitogenic and anti-apoptotic) in addition to its effect on blood glucose concentrations, it has been postulated that hyperinsulinaemia (secondary to insulin resistance) may also drive proliferative and metaplastic changes in gastrointestinal mucosa . Furthermore, elevated levels of leptin and inflammatory mediators such as TNF-α, are also characteristics of an insulin-resistant state . Due to the increasing incidence and very high mortality associated with oesophageal AC, interventions effective in preventing the neoplastic progression of Barrett's oesophagus are urgently needed. Although limited, there are some epidemiological data to suggest that exercise may modulate oesophageal AC risk. Data from one large cohort study suggests that ≥ 100 minutes of physical activity per week (measured by self report), compared to no physical activity is associated with a significant 32% reduction in AC risk, although this association was attenuated when further adjustment was made for BMI . Higher levels of self reported occupational physical activity before the age of 65 have also been associated with a 39% decreased risk of oesophageal AC in one population-based case-control study . Physical activity may act to modulate oesophageal AC risk by reversing the metabolic aberrations associated with Barrett's oesophagus and oesophageal AC. Evidence from clinical trials in overweight individuals without Barrett's oesophagus, suggests that physical activity can significantly reduce leptin concentrations with [39–41] and without [42–44] accompanying exercise induced weight-loss. Beneficial increases in adiponectin have also been observed following 4 weeks of exercise, with results remaining significant after adjusting for body weight, body fat and plasma insulin . Furthermore, physical activity is considered to play an integral role in the treatment and prevention of insulin resistance  and has anti-inflammatory effects [47, 48] which may also benefit Barrett's oesophagus patients. Finally, exercise may lead to reductions in centrally stored body fat which may subsequently reduce gastro-oesophageal reflux symptoms, contributing further to reductions in oesophageal AC risk. Overall, preliminary data from epidemiological studies and evidence from clinical trials in overweight populations provide a strong rationale for trialing physical activity interventions in patients with Barrett's oesophagus to reduce cancer risk. To date no clinical trials have tested the hypothesis that physical activity reduces oesophageal AC risk factors in males with Barrett's oesophagus. The aim of the "Exercise and the Prevention of Oesophageal Cancer" (EPOC) study is to determine the effect of a 24 week moderate-intensity exercise intervention versus stretching on biomarkers associated with oesophageal AC development in overweight or obese, inactive males with Barrett's oesophagus. Our primary outcomes are serum concentrations of leptin, adiponectin, TNF-α, C-reactive protein (CRP), IL-6 and insulin resistance. Secondary outcomes include body composition, gastro-oesophageal reflux symptoms, cardiovascular fitness and muscular strength. 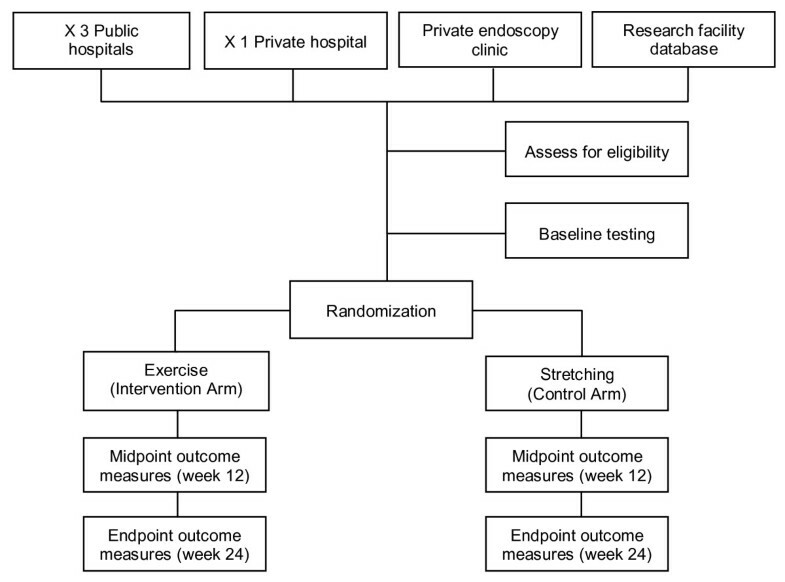 EPOC is a randomized controlled trial with participants randomized into a 24-week exercise intervention arm or a control arm (Figure 2). All outcomes will be measured by study personnel blinded to participants' group allocation. The study is being conducted in Brisbane, Australia. The protocol has been approved by The University of Queensland Human Ethics Committee, and the Human Ethics Committees of the four participating hospitals - Royal Brisbane & Women's Hospital, Princess Alexandra Hospital, Prince Charles Hospital and The Wesley Hospital. This study is aiming to recruit 80 males with Barrett's oesophagus. Barrett's oesophagus is defined as the abnormal appearance of the lining of the distal oesophagus (determined via endoscopy) in addition to histological evidence of intestinal metaplasia (determined via biopsy) . Both newly diagnosed and prevalent cases of Barrett's oesophagus will be included. The study is limited to males only as males are twice as likely to develop oesophageal AC than females . Participants must be English speaking, residing in greater Brisbane, aged 18-70 years, have a BMI between 25 kg/m2 and 34.99 kg/m2 and be performing ≤ 60 minutes per week of moderate-vigorous intensity exercise during the previous 6 weeks. Additionally, participants must not have gained or lost ≥ 5 kg of body weight during the past 6 months. Exclusion criteria include cardiac, respiratory, renal, liver, neurological or inflammatory disease. Individuals with diabetes mellitus, hypertension, hypotension, a cancer diagnosis within 5 years or orthopaedic injuries limiting exercise participation, will also be excluded. Participants will be identified and recruited through gastroenterology department appointments, hospital databases and a research study database. Recruitment will take place over a period of 15 months (May 2009 - August 2010). Patients attending appointments at the gastroenterology departments of three large tertiary hospitals, one private hospital and a private gastroenterology clinic in Brisbane, Australia, are provided with an information sheet by their treating doctor and given an expression of interest form to complete. Potential participants identified by hospital personnel from hospital databases will be posted a letter and an expression of interest form. Potential participants who have expressed interest in joining the study will then be contacted by telephone by study personnel to have the study explained and be screened for eligibility. Participants will enter the study once written informed consent has been obtained. Participants are allocated to the intervention arm or the control arm via computerised randomization http://www.randomization.com, following completion of baseline assessment. The randomization sequence was generated by a research assistant not involved with the study. Group allocation is concealed from investigators using sealed, numbered envelopes. Participants randomized to the intervention arm of the study undertake 60 minutes of exercise, five days per week for 24 weeks. Each session involves: 30 minutes of moderate-intensity aerobic training (60-70% of maximum heart rate) and 30 minutes of resistance training (plus a 5 minute warm-up and cool-down of light intensity). Participants perform one exercise session per week at a hospital gymnasium in small groups under the supervision of study personnel (physiotherapist/exercise physiologist). In addition, each participant is provided with a free gym membership to complete another four exercise sessions independently at a privately run health club in their local area. Participants perform aerobic exercise on treadmills, cycling or rowing stationary ergometers and elliptical machines. During the sessions exercise intensity is measured via the unmodified (6-20) BORG scale. Participants are instructed to maintain their rate of perceived exertion between "somewhat hard" and "hard" (13-15) . The resistance component consists of performing one set of 12-15 repetitions during weeks 0-8; and two sets of 8-10 repetitions during weeks 9-24. Resistance is prescribed to achieve muscular fatigue between 8-15 repetitions depending on the training phase. Exercises include: chest press, leg press, shoulder press, seated row, lunges, assisted chin up, assisted dip and core stability. The program is consistent with the current World Cancer Research Fund and American Institute for Cancer Research recommendations for cancer prevention which advocate 30-60 minutes of moderate-intensity exercise on most if not all days of the week . Participants allocated to the control arm attend a hospital gymnasium once a week to perform 45 minutes of stretching in small groups under the supervision of study personnel. They are also instructed to perform the stretching program independently at home, four times per week. Stretching will act as an 'attention' control condition. Participants in the control arm are instructed not to commence a new exercise program during the study. At the conclusion of the study they are offered an exercise program and a complimentary three month gym membership to a private health club in their local area. Participants document the details of their independent exercise or stretching sessions daily in a physical activity diary. For participants in the intervention arm, attendance at the private health club is also electronically recorded each time they visit via their membership card. Secondary outcome measures such as cardiovascular fitness, muscular strength and body composition will also provide information regarding adherence to the protocol. All primary outcomes are measured at baseline (week 0), midpoint (week 12) and at the conclusion of the intervention (week 24). Biomarkers associated with oesophageal AC development will be measured as primary outcomes via blood samples. Fasting blood samples of 30 ml will be obtained by blood collectors from an accredited pathology laboratory from the antecubital vein between 08:00-10:00 am and at least 24 hours post exercise to minimize diurnal fluctuations and acute exercise effects. Blood samples will be centrifuged within 20 minutes of collection and stored at -80°C. Laboratory personnel will analyse the samples in two batches over a period of 24 months. Serum leptin will be analysed via radioimmunoassay (RIA) (Linco Research, Missouri, USA) and serum adiponectin (total and HMW) by an enzyme-linked immunosorbent assay (ELISA) (Linco Research, Missouri, USA). The inter- and intra-assay coefficients of variation (CV) are < 8% for leptin and < 9% for adiponectin. Fasting serum insulin will be analysed using an immunoenzymatic 'sandwich' assay via an ACCESS system (Beckman Coulter, Fullerton, USA) and plasma glucose concentrations determined with an oxygen rate method via the SYNCHRON system (Beckman Coulter, Fullerton, USA) with an inter- and intra-assay CV of < 5% for both insulin and glucose. Insulin resistance will be calculated using the reciprocal index of homeostasis model assessment (HOMA-IR)  and the Quantitative Insulin Sensitivity Check Index (QUICKI) . Both measures calculate ratios of fasting insulin:glucose concentrations using different algorithms and have been shown to be reproducible and valid measures of insulin resistance. Serum concentrations of CRP will be analysed using a high sensitivity Near Infrared Particle Immunoassay with the SYNCHRON system (Beckman Coulter, Fullerton, USA). Inter- and intra-assay CV is < 5%. IL-6 will be measured in serum with the Immulite 2000 analyser using an immunometric assay (Siemens, USA) with an inter- and intra-assay CV of < 7%. Serum TNF-α will be measured using a Bio-Plex suspension array system via immunoassay (Bio-Rad laboratories, Hercules, USA), with inter-assay CV of < 8% and intra-assay CV of < 6%. Secondary outcomes will also be measured at week 0, 12 and 24. Body fat and fat free mass will be measured in triplicate using bioimpedance spectroscopy (ImpediMed SFB7, ImpediMed Ltd., Australia). Typical coefficients of variation within a measurement session range from 0.3 to 3.0% . Waist circumference will be calculated in duplicate at the midpoint between the lower costal (rib) border and the iliac crest. Hip circumference will be measured in duplicate as the maximum diameter at the greater trochanter. Waist-to-hip ratio will also be determined. BMI will be calculated (weight [kg]/height [m]2) as it is a reasonable measure of global adiposity. Height is measured using a stadiometer to 1 mm, without shoes, arms by side and heels together. Weight is measured to the nearest 0.1 kg in light clothing, without shoes, on a calibrated scale (UC-321, A&D Co. Ltd., Japan) with an empty bladder. Cardiovascular fitness will be estimated using peak oxygen uptake (VO2peak) during the Modified Shuttle Walk Test . VO2peak will be measured using a Cortex Metamax 3 portable metabolic analyser (Cortex:biophysik, GMbH, Germany) during the test. VO2peak is the highest oxygen uptake achieved with an increasing external work rate, but unlike VO2max, a plateau in oxygen uptake may not be observed. VO2peak is a useful estimation of cardiovascular fitness as not every participant may reach VO2max before symptom limitation occurs . One-repetition maximum (1 RM) tests will be performed on the bench press and leg press to measure muscle strength. 1 RM is the maximum weight a person can lift only one time with correct technique. 1 RM has shown to be a reliable and valid measure of strength in middle aged, untrained adults . There is no gold standard test to diagnose or monitor gastro-oesophageal reflux disease . Gastro-oesophageal reflux symptoms will be measured using the Gastro-esophageal Reflux Disease Impact Scale (GIS) which is short and simple to use; responsive to change over time; completed by patients and has documented internal consistency, reproducibility and construct validity . Participants will document medication use and all protocol and non-protocol exercise performed in a daily log; smoking habits will also be recorded every 4 weeks. The International Physical Activity Questionnaire (IPAQ), (long, last 7 days, self-administered format) [60, 61] will also be completed by participants at week 0, 12 and 24 and will provide additional information regarding incidental, job and leisure time physical activity; and sitting time over a one week period. All participants will be instructed to maintain a consistent diet throughout the study and this will be evaluated via a Food Frequency Questionnaire completed at week 0, 12 and 24. There is limited evidence on which to base the minimum detectable difference for the sample size calculation. Namely, the magnitude of change in the primary biomarker outcomes that is associated with a reduction in oesophageal AC risk is not known. A minimum difference of 10% between the means of the intervention arm and the control arm for all primary outcomes is likely to produce a clinical benefit and is achievable by the intervention. Standard deviations were based on those observed in previous clinical trials investigating the effect of exercise on overweight or obese, inactive, healthy males. Thus, a sample size of 40 participants per group (80 in total) is needed to detect a minimal difference of 10% in primary outcomes between groups, with 80% power, a type I error of 5% and allowing for 10% attrition (two-tailed). Generalised linear models, estimating variance appropriately for repeated measures, will be used to determine whether there are differences between the exercise intervention group and the control group in primary and secondary outcomes. Models will be adjusted for baseline outcome values, to account for regression to the mean, as well as the main effects of group, time and their interaction. Mediation and moderation of intervention effects will be examined with change in body weight, body fat, minutes exercised per week and VO2peak considered a priori to be of potential interest. Analyses will be performed using intention-to-treat principles and on a per-protocol basis. Statistical significance will be set at p < 0.05 (two-tailed). The EPOC study aims to determine whether exercise can modulate the biochemical pathways to oesophageal cancer development in males with the pre-malignant condition Barrett's oesophagus. Exercise may prove to be an effective intervention in reducing the risk of oesophageal AC development which would have important health implications for males with Barrett's oesophagus. Moreover, findings from the EPOC study will help to further define the role of exercise in the primary prevention of cancer by adding to the limited number of clinical trials of exercise interventions and cancer-related biomarkers [62–71]. As participants targeted by the EPOC study may be at an even higher cancer risk than those previously studied, greater exercise intervention effects may be observed. Lastly, the biological mechanisms underlying the inverse association between physical activity and carcinogenesis can be further explored. Brooke M Winzer contributed equally to this work. The project has been funded by grants from The Wesley Research Institute and Queensland Health (Cancer Care Allied Health Research Scheme). We would like to thank Goodlife Health Clubs Brisbane for donating gym memberships to our participants. BMW is supported by an Australian Postgraduate Award. DCW is a Principal Research Fellow and MMR is a Training Research Fellow of the National Health and Medical Research Council of Australia. DCW developed the study concept. BMW, DCW and JDP developed the study protocol. BMW drafted the manuscript. All authors contributed to the final manuscript.